Samuel Clarke (October 11, 1675 – May 17, 1729) was an English philosopher who was noted for his pursuit of natural theology and philosophy as he placed an emphasis on a logical and rational approach to essentially spiritual questions such as the attributes of God and the immortality of the soul, as well as his pursuit of the questions of science in his thorough analysis of the ideas of Isaac Newton. Samuel Clarke is best known for his dialogue with Leibniz, in which he seeks to provide a rational argument in the defense of natural theology and Newtonianism. The son of Edward Clarke, an alderman who represented the city of Norwich in parliament, Samuel Clarke was educated at the free school of Norwich and at Caius College, Cambridge. The philosophy of René Descartes was the reigning system at the university; Clarke, however, mastered the new system of Isaac Newton, and contributed greatly to its extension by publishing a Latin version of the Traité de physique of Jacques Rohault (1620-1675) with valuable notes, which he finished before he was 22 years old. The system of Rohault was founded entirely upon Cartesian principles, and was previously known only through the medium of a crude Latin version. Clarke's translation (1697) continued to be used as a textbook in the university until the treatises of Newton, which it had been designed to introduce, supplanted it. Four editions were issued, the last and best being that of 1718. His younger brother, Dr. John Clarke, dean of Sarum, translated it into English in 1723. Clarke devoted himself to the study of scripture in the original, and of the primitive Christian writers. Having taken holy orders, he became chaplain to John Moore, bishop of Norwich, who became his friend and patron. 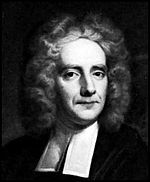 In 1699 he published two treatises: Three Practical Essays on Baptism, Confirmation and Repentance and Some Reflections on that part of a book called Amyntor, or a Defence of Milton's Life, which relates to the Writings of the Primitive Fathers, and the Canon of the New Testament. In 1701 he published A Paraphrase upon the Gospel of St. Matthew, which was followed, in 1702, by the Paraphrases upon the Gospels of St. Mark and St. Luke, and soon afterwards by a third volume upon St. John. They were subsequently printed together in two volumes and have since passed through several editions. He intended to treat in the same manner the remaining books of the New Testament, but his design was unfulfilled. Meanwhile he had been presented by Bishop Moore to the rectory of Drayton, near Norwich. As a Boyle lecturer, he dealt in 1704 with the “Being and Attributes of God,” and in 1705 with the “Evidences of Natural and Revealed Religion.” These lectures, first printed separately, were afterwards published together under the title of A Discourse concerning the Being and Attributes of God, the Obligations of Natural Religion, and the Truth and Certainly of the Christian Revelation, in opposition to Thomas Hobbes, and Spinoza, the author of the Oracles of Reason, and other Deniers of Natural and Revealed Religion. In 1706 he wrote a refutation of Dr. Henry Dodwell's views on the immortality of the soul, and this drew him into controversy with Anthony Collins. He also translated Newton's Optics, for which the author presented him with £500. In the same year through the influence of Bishop Moore, he obtained the rectory of St Benet's, Paul's Wharf, London. Soon afterwards Queen Anne appointed him one of her chaplains in ordinary, and in 1709 presented him to the rectory of St James's, Westminster. He then took the degree of doctor in divinity, defending as his thesis the two propositions: Nullum fidei Christianae dogma, in Sacris Scripturis traditum, est rectae rationi dissentaneum, and Sine actionum humanarum libertate nulla potest esse religio. During the same year, at the request of the author, he revised William Whiston's English translation of the Apostolical Constitutions. In 1712 he published a carefully punctuated and annotated edition of Caesar's Commentaries, with elegant engravings, dedicated to John Churchill, 1st Duke of Marlborough. During the same year he published his celebrated treatise on The Scripture Doctrine of the Trinity. It is divided into three parts. The first contains a collection and exegesis of all the texts in the New Testament relating to the doctrine of the Trinity; in the second the doctrine is set forth at large, and explained in particular and distinct propositions; and in the third the principal passages in the liturgy of the Church of England relating to the doctrine of the Trinity are considered. Whiston says that, some time before publication, a message was sent to him from Sidney Godolphin "that the affairs of the public were with difficulty then kept in the hands of those that were for liberty; that it was therefore an unseasonable time for the publication of a book that would make a great noise and disturbance; and that therefore they desired him to forbear till a fitter opportunity should offer itself,"—a message that Clarke entirely disregarded. The ministers were right in their conjectures; the work not only provoked a great number of replies, but also occasioned a formal complaint from the Lower House of Convocation. Clarke, in reply, drew up an apologetic preface, and afterwards gave several explanations, which satisfied the Upper House. In 1715 and 1716 he had a discussion with Gottfried Leibniz in relation to the principles of natural philosophy and religion and Newtonianism, which was at length cut short by the death of Leibniz. A collection of the papers that passed between them was published in 1717 (cf. The Leibniz-Clarke Correspondence). In 1719 Nicholas 1st Baron Lechmere presented him to the mastership of Wigston's hospital in Leicester. In 1724 he published seventeen sermons, eleven of which had not before been printed. In 1727, on the death of Sir Isaac Newton, he was offered by the court the place of master of the mint, worth on an average from £1200 to £1500 a year. This secular preferment, however, he absolutely refused. In 1728 was published "A Letter from Dr Clarke to Benjamin Hoadly, F.R.S., occasioned by the controversy relating to the Proportion of Velocity and Force in Bodies in Motion," printed in the Philosophical Transactions. In 1729 he published the first twelve books of Homer's Iliad. This edition, dedicated to William Augustus, Duke of Cumberland, was highly praised by Bishop Hoadly. On Sunday, May 11, 1729, when going out to preach before the judges at Serjeants' Inn, he was seized with a sudden illness, which caused his death on the Saturday following. Soon after Clarke’s death, his brother, Dr. John Clarke, published from his original manuscripts An Exposition of the Church Catechism and ten volumes of his sermons. The Exposition is composed of the lectures that he read every Thursday morning, for some months in the year, at St James's Church. In the latter part of his life he revised them with great care, and left them completely prepared for the press. Three years after his death appeared also the last twelve books of the Iliad, published by his son Samuel Clarke, the first three of these books and part of the fourth having, as he states, been revised and annotated by his father. In his disposition Clarke was cheerful and even playful. An intimate friend relates that he once found him swimming upon a table. At another time Clarke on looking out at the window saw a grave blockhead approaching the house; upon which he cried out, "Boys, boys, be wise; here comes a fool." Dr. Warton, in his observations upon the pope's line, "Unthought-of frailties cheat us in the wise," says, "Who could imagine that Locke was fond of romances; that Newton once studied astrology; that Dr. Clarke valued himself on his agility, and frequently amused himself in a private room of his house in leaping over the tables and chairs?" In order to establish his sixth thesis, Clarke contends that time and space, eternity and immensity, are not substances but attributes—the attributes of a self-existent being. Edmund Law, Dugald Stewart, Henry Brougham, and many other writers, have, in consequence, represented Clarke as arguing from the existence of time and space to the existence of Deity. This may be regarded as a misinterpretation. The existence of an immutable, independent, and necessary being is supposed to be proved before any reference is made to the nature of time and space. Clarke has been generally supposed to have derived the opinion that time and space are attributes of an infinite immaterial and spiritual being from the Scholium Generale, first published in the second edition of Newton's Principia (1714). However, Clarke's work on the Being and Attributes of God appeared nine years before that Scholium. The view propounded by Clarke may have been derived from the Midrash, the Kabbalah, Philo, Henry More, or Ralph Cudworth, or possibly from conversations with Newton. Clarke's ethical theory of "fitness" is formulated on the analogy of mathematics. He held that in relation to the will things possess an objective fitness similar to the mutual consistency of things in the physical universe. This fitness God has given to actions, as he has given laws to Nature; and the fitness is as immutable as the laws. The theory was criticized by Jouffroy, Amédée Jacques, Sir James Mackintosh, Thomas Brown and others. It is said, for example, that Clarke made virtue consist in conformity to the relations of things universally, although the whole tenor of his argument shows him to have had in view conformity to such relations only as belong to the sphere of moral agency. It is true that he might have emphasized the relation of moral fitness to the will, and in this respect Johann Friedrich Herbart has been regarded as having improved on Clarke's statement of the case. To say, however, that Clarke simply confused mathematics and morals by justifying the moral criterion on a mathematical basis is a mistake. He compared the two subjects for the sake of the analogy. Clarke had an influence on Enlightenment philosophers including Lord Monboddo, who referred to Clarke's writings in at least twelve different publications. Generally, Monboddo concurred with Clarke on theological topics and in regard to Newtonian ideas, but criticized Clarke for his "inadequate knowledge" of the ancients. Clarke's work as a whole has been regarded as an attempt to present the doctrines of the Cartesian school in a form that would not shock the conscience of his time. Le Rossignol, J. E. 1892. Ethical Philosophy of S. Clarke. Leipzig. Ziinmermann, Rob. 1870. Denkschriften d. k. Akademie der Wissenschaften, Phil. Hist. Classe. Vienna. All links retrieved May 24, 2013. This page was last modified on 24 May 2013, at 14:49.